Promotional activity of Asian-Pacific City Summit at Asian Townscape Awards Ceremony! The Asian Townscape Awards are designed to honor cities, regions, projects, etc. that have played a significant role as models in landscape construction. The theme of 2011 Asian Townscape Awards was "Living Environment and Urban Revival". Asian-Pacific City Summit secretariat set up a promotional booth at the venue for the Asian Townscape Awards Ceremony and distributed leaflets and summit reports. Many participants for the ceremony dropped in our booth. 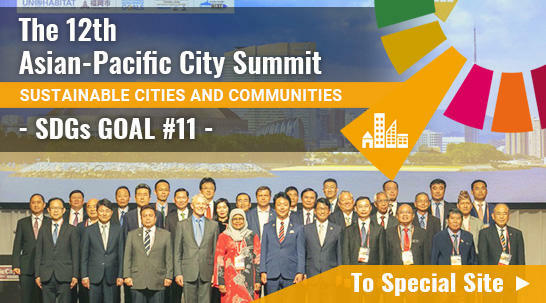 4 member cities of Asian-Pacific City Summit won the Asian Townscape Grand Awards!